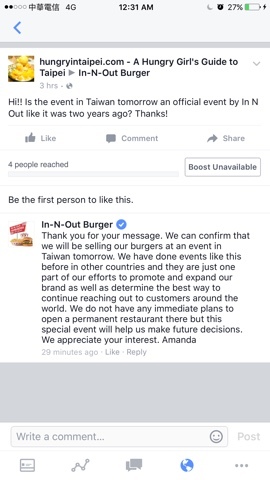 Luckily I had a friend give me a heads up about the In N Out pop up tomorrow. TOMORROW APRIL 7TH! YES, it is a real thing, not an April Fools' joke. The last time I heard about it a few years ago (thanks to Instagram), my friends went running and got their burgers after a few hours. 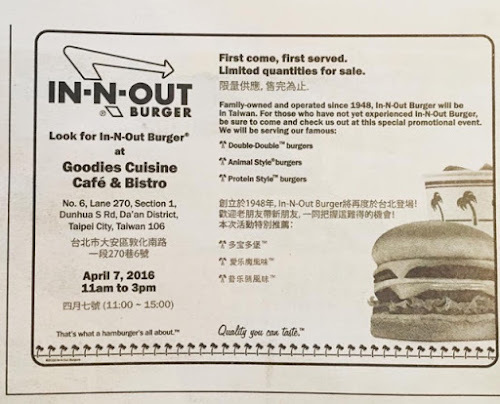 I can't make it tomorrow, but if you have the patience and the cravings you can try your luck tomorrow at Goodies Cuisine (and that means showing up at least at 10am). Report back here if you succeed! You're welcome! So....they sold out at 10am, even though the event was supposedly starting at 11am. I say open in Taipei but don't bring "pop ups ". It just upsets people who must work and cannot wait in a long line. Please stop "pop ups". Thank you Sooooooo much for posting this and sharing!!! I got there early and got my burger!!!! Thank you Sooooooo much for posting this and sharing!